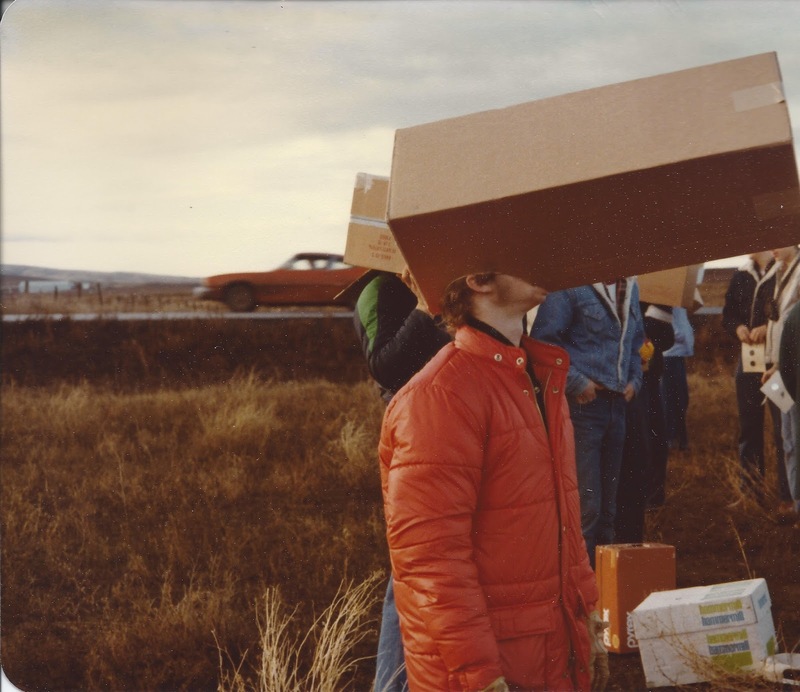 The Goldendale, Washington, eclipse, as photographed by me, February 26, 1979. It took our school bus about four hours to reach Goldendale, Washington. Along the way, we stopped at the Bonneville Dam. This was a field trip for the physics class and the TAG program of Philomath High School. On our tour of the dam, we saw the fish ladders, visited the cavernous turbine room, and witnessed a barge moving through a ten-story tall lock. All of this was impressive, probably worthy of its own field trip, like the one we'd taken earlier in the year to the Trojan nuclear plant in Rainier, Oregon. But it was really just a prelude, a way of squeezing more learning out of the two minute event we had traveled hundreds of miles to see: a total eclipse of the sun. Geographically speaking, we could have traveled just to Portland, which would also be in the path of totality; but Mr. Gosser, our physics teacher, had lived in Oregon for most (probably not all--I remember him having a bit of a Southern drawl) of his life, and knew better than to count on clear skies in February. For that, we would need to travel east of the Cascades. Goldendale had advantages apart from being on the clear side of the mountains: of all the municipalities meeting that criterion, it was the closest geographically to Philomath. It was also home to an observatory, which was promoting an eclipse festival. Mr. Gosser made arrangements with the local high school, and we were able to sleep on the floor of the gymnasium. I went to bed with a sore throat and congested sinuses--probably a winter cold--and upon waking up at 6 a.m., took a Contac. We had a cold breakfast of granola bars and orange juice, then headed out to the dark parking lot, where we groaned at what we found. It seemed all our travel had been for nought: it was cloudy over Goldendale. "The forecast says it'll clear up by 7:30," Mr. Gosser said optimistically. I expect he was silently praying for clear skies: the school Bible study met in his lab at lunchtime, and I knew him to be a creationist, despite his formidable (to me) knowledge of the hard sciences. As the zero hour approached, rippling shadows began to race across the grass. Then with a rush that left us gasping, the edge of the moon's shadow passed over us at 1800 miles an hour (It's well-described in Annie Dillard's poetic account of the same eclipse, published in The Atlantic a few years later), and then it was there, a sight that drove generations of more primitive humans to madness: a smear of bright light with a perfectly round spot of darkness in its center. The sun was gone, replaced by a demon, a hole in the sky. I began snapping pictures with the 35mm camera I had borrowed from the yearbook teacher. None of them really turned out--you can see the best one at the top of this page--but that's beside the point. I'd seen a lunar eclipse before--my father had set up my telescope in the back yard for that event, a few years earlier--so this was not my first experience of one world passing in front of another. I'd also spent many an hour staring, slack-jawed, into the depths of the night sky; and stayed up late at Scout camp for a meteor shower that was the best light show I'd ever seen. Even so, this was the hardest evidence I'd ever had that I, like everyone around me, was nothing more than a speck of matter, pinned by gravity to a spinning ball of rock as it swung around a much vaster ball of burning gas. 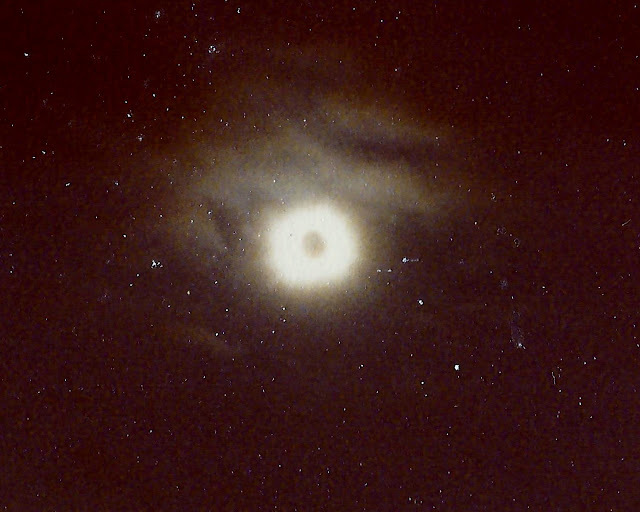 There were just two minutes of totality, give or take, and then the brilliant diamonds of Bailey's Beads announced that the sun was about to break away from the moon's disk. Moments later, we had to avert our eyes once more. As we did, we broke into applause, as if the sun had been a rock star performing our favorite song for us. This was much more than that, of course, but I have had similar experiences at concerts, and it's the main reason I want to be at a large gathering when next Monday's eclipse takes place. Once the sun was back out, we gathered our things and were very soon on the bus, headed south once more. We stopped at Maryhill, Washington's Stonehenge, a replica of England's World Heritage site, fashioned from concrete rather than standing stones. There we encountered a different kind of spectacle: the site was teeming with pagans who'd journeyed there to watch the eclipse. As I walked up to the memorial, a woman was talking animatedly about the chicken she'd sacrificed earlier that morning, noting the irony of nonbelievers questioning the practice "as they eat their McDonald's hamburgers." I wondered if any of these pagans knew that the replica at which they'd been practicing their religion had been created as a World War I memorial, and had no real relation to whatever ancient religion had been observed at the original. (Although I did just learn from Wikipedia that the altar in the center is aligned with the position of the sun at summer solstice.) Afterward, we visited the Maryhill Museum, a charming facility well worth a field trip in its own right, but a major anti-climax after the life-changing event of the eclipse. Then it was home to Philomath, where we arrived in time for some afternoon classes. On that morning in Goldendale, the world stopped revolving around me. That's a big thing for a teenager to realize: that there is much more to the world than his own personal drama, whether it's the disappointment of losing a peer election or the triumph of achieving a dream. Everything that had come thus far, that had made my life seem more tragic than any other human being's, shrank to insignificance as I watched the sun disappear, saw the corona bloom, ached to hang onto the moment, then all too soon had to give it up. I date my entry into adulthood from that date. Ten and two months later, another watershed moment arrived, as on May 3, 1989, my world began revolving around a little girl. That's a wholly other story, on a much smaller cosmological scale, but of even greater significance to my identity as a human being. Both moments altered the path of my traverse through the world of human beings. The eclipse is a memory, a point seared into my brain like the sun is burned into the retina of an unprotected eye. Sarah's birth, on the other hand, was just the beginning of a relationship that will continue to affect my path until its end. And that is another story, one I will tell elsewhere and at another time.